At GIK Acoustics, customer satisfaction is our #1 priority. Our team is here to ensure that you get the most out of our products. These FAQs are designed to provide a better understanding of GIK Acoustics, our products and our website. What is the difference between GIK products and others? There’s a difference between a GIK Acoustics product and all others on the market. We separate ourselves from other acoustic treatment manufacturers in 6 primary areas. Pound for pound, GIK Acoustics’ products absorb more sabins (sound) than any other product on the market. We provide our customers the most cost effective solution to make every space sound it’s best. In addition to providing knowledgeable recommendations, GIK Acoustics maintains contact throughout the order process. Our trained Customer Service team ensures quality, timely delivery and reliability. And our staff is available to help with special needs or custom orders. When it comes to improving the sound quality in a room, many find the science to be overwhelming and the task of DIY’ing acoustic treatments to be daunting. As part of our commitment to our customers, GIK Acoustics provides Educational Articles and Videos to demystify room acoustics. It’s long been our goal to help customers truly understand how sound behaves in a space and the importance and benefits of proper room treatment. Over the past 10 years, GIK Acoustics has pioneered a number of acoustic treatments that you can’t find anywhere else. From the Tri-Trap Corner Bass Trap to our Soffit Bass Trap to the built in Scatter Plate, GIK continues to innovate. How long has GIK Acoustics been in business? Glenn Kuras started GIK Acoustics in Atlanta, GA, in 2004. As a musician, Glenn knew the importance of great sound and he founded the company on a philosophy to provide quality products AND quality information. Glenn brought together a team whose experience and passion would add to the company’s overall growth. Within four years, GIK Acoustics expanded and GIK Acoustics-Europe was opened in Bradford, UK. Today, GIK Acoustics is still driven by Glenn’s desire for innovation, product excellence and outstanding customer satisfaction. Do you have a showroom? Can I come visit GIK Acoustics? We welcome visitors to our office in Bradford; however, we don’t have a showroom or physical store. As it’s our workplace, we suggest giving us a call so we can schedule a good time for you to come by. Simply contact us at customerservice.eu@gikacoustics.com or +44 (0) 20 3815 8608 (UK). Where are your panels shipped from? I live in West Yorkshire or will be in the area, can I pick up panels and avoid the shipping costs? Customers can arrange to pick up items from our Bradford plant, but please bring a large vehicle. Simply contact us at customerservice.eu@gikacoustics.com or +44 (0) 20 3815 8608 (UK). 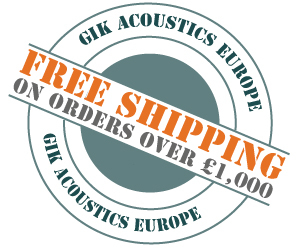 We also offer free shipping in Europe on orders over £1,000 from GIK Acoustics-Europe. Within the EU, we ship using UPS. For large orders (over 10 boxes) we ship via Freight. Please see our shipping policies here: GIK Policies page. I just placed my order. When can I expect delivery? Thanks for your business! We build everything to order, and typically orders are shipped within 7-10 working days. Once your order is complete, it will ship from our facility and you’ll receive tracking updates directly from UPS. Shipping usually takes anywhere from one to five days depending on your distance from Bradford UK. If you need any special accommodations for shipping, please contact us directly. I ordered the wrong item. How can I return a product? You may return items for a full refund (excluding custom products) within 30 days. We require customers to pay for roundtrip shipping – the cost to send products to you and the cost to ship returns back to us. The entire purchase price of the products will be refunded as soon as we receive the panels. You can see our Return Policy here: GIK Policies page. Simply contact us at customerservice.eu@gikacoustics.com or +44 (0) 20 3815 8608 (UK). Can I order custom sized panels? We can absolutely manufacture acoustic panels and bass traps per your specifications. We’ve done all sorts of custom orders from smaller sizes to extra large panels. We offer custom size products in our 9 standard fabrics or in any Camira Cara or Camira Lucia fabric upgrade. Just contact us to get started! customerservice.eu@gikacoustics.com or +44 (0) 20 3815 8608 (UK). Do I really need room treatment? I need help with my room, how do I contact you? We are proud to offer free, expert Acoustic Advice. Our well-respected design team has years of experience and are available to provide assistance not only with product selection but product placement within your room. Click here to fill out our Acoustic Advice Form, which is sent directly to glenn.k@gikacoustics.com. You may also email Glenn directly glenn.k@gikacoustics.com or give us a call at +44 (0) 20 3815 8608 (UK). What is the difference between acoustic panels and foam? We are asked this question a lot, so we have a thorough explanation here: Comparing Acoustic Foam to GIK 244 Bass Traps – Test Analysis. How well do GIK products perform? GIK Acoustics has submitted our products to an independent, third party acoustic laboratory for testing. The value of the testing is to illustrate and substantiate the effectiveness of GIK Acoustics products. To locate the results from Riverbank Acoustical Laboratories or the Acoustics Research Center at the University of Salford, simply look for the “Test Results” tab next to the description of the product. There you will find an overview of the performance along with a link to the lab’s report. If you should still have any questions about the effectiveness, please feel free to contact us at customerservice.eu@gikacoustics.com or +44 (0) 20 3815 8608 (UK). My roommate/neighbor/landlord isn't nearly as satisfied as I am with my phat kick drum. Will bass traps or acoustic panels help reduce the sound leaving my room? Acoustic treatments in a room affects how sound moves inside the air in the room. In order to get proper isolation and reduce sound transmission, you have to change how sound moves along the actual walls, which can usually only be done by construction. If you need isolation, we recommend contacting a contractor in your area that has successfully completed isolation projects in the past with satisfied, happy clients. Do your panels panels come with everything I need to hang them? Our standard acoustic panels come with eyehooks on the back and picture wire, so they hang like a large picture frame. The only thing you’ll need is picture hanging hardware. We recommend Ooks Hooks (see link) since they only create a small nail hole, but if a stronger hold is necessary, drywall anchors or french cleats can be used instead. We’ve crafted some helpful articles and videos to guide you through the ceiling and corner installation. Click the following links for our recommended methods for installing Acoustic Panels and Bass Traps. I don't wish to hang the panels on the walls. What are my options? Our corner bass traps, like the GIK Tri-Trap and GIK Soffit Trap are freestanding and don’t require mounting to the walls. You can affix any of our standard panels on GIK Custom Metal Stands or you can affix them to your boom stand using our Boom Stand Brackets. We also carry two different gobos that don’t require mounting to the wall: the GIK FreeStand Acoustic Panel and GIK Screen Panel. How do I hang panels from the ceiling? Our Cloud Mounting Brackets can be used to mount the GIK 242 Acoustic Panels, and the 244 and Monster Bass Traps from the ceiling. Other ceiling mounting methods are spelled out on our article: Acoustic Panel or Bass Trap Ceiling Mounting. To mount products in the ceiling corners, check out our article: Mounting Bass Traps in Corners. Each of the product pages has a “Colors Available” tab left of the description which shows the available colors for any product. How high up should I hang my panels? Typically, most panels are centered around ear height or tweeter height in the room, but there can be variance depending on the use of the panels. Do bass traps only absorb bass frequencies? We offer broadband bass traps which absorb bass, mid, and high frequencies – like the Tri-Trap Corner Bass Trap, 244 Full Range Bass Trap, Monster Full Range Bass Trap, and Soffit Bass Trap. We also offer targeted bass traps that are limited in the frequencies that they absorb, like the 244 Range Limiter Bass Trap, the Monster Range Limiter Bass Trap, and the GIK Scopus Tuned Trap, which can be tuned to absorb a particular range of bass frequencies. Please see Understanding Different Bass Trapping if you want to learn more about the differences between bass traps. I have a bookshelf in my room, does that help diffuse the sound? No – bookshelves don’t work very well as diffusors. First of all books (if anything) will be more absorptive than reflective. Second, random depths of books on a shelf do not generate even, random reflections. The width, height, spacing, and pattern of the wells of a diffusor are carefully calculated to make sure they generate a smooth and even scattering of the waves over a 180 degree angle. Third, without this calculated spacing, reflected sound waves will interfere with direct sound which can create comb filtering. In effect you’re likely to get very little of the benefit of a professional diffusor while creating more issues in the frequency response. Overall, the best way to obtain proper diffusion is not through a home remedy but to utilize carefully calculated and professionally manufactured diffusors. Such as the GIK Acoustics Q7d Diffusor, Demi Q7d Diffusor, VersiFusor or built-in Scatter Plate. This entry was posted in Articles, News and tagged acoustic panel, bass trap, diffusor, faq, frequently asked questions.